Stephen is an A grade electrician and part-time trader from Melbourne. He has an electrical business, specializing in electrical work, air conditioning and data services. He mainly trades ASX blue chips and the ASX 200 and has been doing so for 10 years. 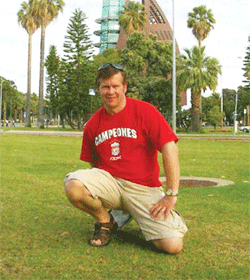 Stephen is originally from the United Kingdom and have been living in Australia for 28 years. He trains at the gym, trains in martial arts, goes walking and likes to read about history, political science, and psychology and trading. One of my other passions is travelling. When I first came to Australia, I got to know a work colleague who was an investor in the share market. This interested me and I set out to read and learn about the share market with a view to buying some shares. I read the investment page in the newspaper, learned about dividend reinvestment, franking credits and blue chip shares. I contacted a full service broker and started to receive their newsletter and recommendations. At that stage in life, my mid-20s, I was already interested in financial freedom and knew that I had to make some decisions. My thinking at that time was to create my own portfolio of blue chip shares alongside my company superannuation fund, and actively buy shares and reinvest the dividends. My goal was to use this portfolio to buy my first house. I realized this goal in about 8 to 9 years’ time. So you could say I was a buy and hold investor. I decided that after this goal was achieved I could replicate, and decided to purchase an investment property and borrow some money for shares. I bought the property and also had some extra funds, which I used to purchase CBA shares at around $33. Within 1 or 2 months of the CBA purchase the shares had fallen to $30, which was interesting to say the least. After looking at the percentage return of the suburb I was living in at that time and comparing it to the potential returns of some of the Blue Chips stocks on the ASX, that there were good gains to be made on the ASX, and my investing in major companies like BHP and Woolworths would be a relatively low risk approach. I kept on buying shares. I bought some BHP and WOW shares, using a line of credit. These shares did quite well and I, made a 25% return. How have you been able to educate yourself about the markets? From the initial exposure to a full service broker, and reading the financial columns in newspapers. I also read “Earn more , work less “ by Ian Huntley. Then, a work friend of mine at the time who was an active trader and had done a few trading seminars suggested I look at Wealth Within as they offered a Short Course in Share trading and a Diploma of Share Trading and Investment. I investigated Wealth Within’s website and purchased Dale Gillham’s book “How to Beat the Managed Funds by 20%“. I read Dale’s book cover to cover, then went back and read it again and thought, this is awesome and it peaked my interest in trading. Yes I did. I made the mistake of getting caught up in the market noise and reading journalist “stock picks “. Another was not setting my stop losses right and not allowing the trades to unfold. I was getting stopped out too quickly. I learnt the importance of reviewing my analysis. I could have back tested a bit more and this would have allowed me to set a better stop. This taught me all about the psychology around when you first buy a share. Would you describe yourself as a discretionary trader, mechanical trader or combination of both? I have actually always traded that way. I follow steps when trading mechanically and some stocks I trade better this way. Whereas discretionary trading is about using the art of trading. It’s a poetic licence to steer away from the plan at a particular point in time because of what the analysis is indicating. I realised that the choice comes down the personality of the stock. Who have been your mentors and role models? The team at Wealth within have been a great help to me, especially Dale Gillham and Janine Cox. I also have a couple of friends who are active traders and it’s always great to chat to them and exchange ideas and offer encouragement. Can you share a brief view of your trading style? I have a few different methods to select stocks. Sometimes I use the “top down methodology “ - where you would look at the industry index and if its conditions suit what you are looking for then I proceed to look for individual stocks within that index and select them on their merits. I also just open up the ASX 200 in Market Analyst and cycle through all the charts looking for the stocks that are in an uptrend. Also I note the stocks that are in a downtrend or going sideways. Once I have a number of stocks, I would then analyse them further to see if I can draw trend lines on the charts. I would look to see how long the uptrend has been going. I would analyse how long the uptrends tend to run for that stock. I would look at continuation patterns and what tends to happen when the continuation pattern ends. I would also look at liquidity, as I want to make sure that when I have to exit the stock that there is liquidity there to enable that. Then I start to backtest and test various trading methods and also learn about the personality of the stock, maybe what it does at various support and resistance levels. I also like to select stocks that have momentum behind them. Moreover, I have a look at what the company does, what it produces, where its market is etc. Is there any (win or loss) that has had a profound effect on your development as a trader? If so, what did you learn from the trade? I purchased some RIO and CTX shares a few years ago, then the Queensland floods happened and I suffered some losses. When the Fukishima Tsunami happened , it again triggered some losses. It really made me question what I was doing and if I could be successful at trading. After some thinking and reflection I realized that you cannot win all the time and that losses are inevitable. After all, the back testing we do produces a 70% chance of success. No matter how good your analysis is, it cannot predict natural disasters or wars or anything else that can send the market into a tailspin. The losses are mentioned above. One of the best trades, I have done is with A2M. I was watching it for a while, checking the chart out weekly. I researched the company and read about China ending its one child policy, I read about a Chinese milk company that produced tainted milk and that made the Chinese consumers look elsewhere for their baby formula. After back testing, I started trading A2M at around the $2.20 mark, stop loss in place, and made quite a few gains and 1 or 2 losses. I was lucky enough to be in the stock when it announced its record profit. That had a profound effect on my trading and how I could generate a profit that would mean I covered at least 3 months of my salary one trade. Would you consider myself a short term trader or long term trader? What advice would you offer to people getting started as traders on the relative merits or otherwise of each? At the moment, I would consider myself a medium term trader. I do the analysis, back testing, buy the stock and put the stop loss on. My advice is to always do back testing, a full analysis of the stock, and proper due diligence. My particular style is that I don’t want to be glued to the screen all day, I want to do the analysis, put my trade and my stop loss on and let the market unfold, whether it goes one way or the other, without getting caught up in the day to day emotion. Trading has to suit my lifestyle, not be my lifestyle. It is interesting to observe media hype around short term trading, Bitcoin and Forex. I would recommend any novice to focus on medium to long term share trading, as it’s not as volatile and you get to know the market and the type of trading approach that works. Once your strategy is mastered and you are generating a consistent return, your option as Dale says is, get the process right and all you do is move the decimal point, and/or progress to shorter-term trading time frames. I trade shares on the ASX200. In the future I would like to investigate the US market. With the ASX 200 you are dealing with a lot of quality companies. In the past I found that when reviewing the ASX20 there may have been times when I couldn’t find stocks that were trending well that I liked, so I decided to broaden my range. Even though I increased the range, I was able to narrow down my particular criteria to filter out stocks. I guess I try to keep my style as simple as possible without over complicating it. I like trend lines and also that the Gann swing daily, weekly and monthly are pointing up. Ed Seykota says “Everybody gets what they want from the markets”. What do you “get” from the markets? On a physical level, trading has provided me with an extra source of income. It has allowed me to meet other traders and exchange ideas. It has opened a door for me to learn more about myself, to analyse my beliefs with respect to trading. Trading has given me a degree of autonomy; it has allowed me to focus on the things I want to do and to create the time to do them. What books , seminars and courses have you read or attended and which would you recommend? “How to beat the managed funds by 20% “by Dale Gillham. Your Trading Edge magazine. “The Winners Bible “by Dr Kerry Spackman, “The Miracle of Mindfulness“ by Thich Nhat Hanh and “Outliers“ by Malcom Gladwell. For courses I would I definitely recommend the Diploma of Share Trading and investment. It starts with bread and butter and proceeds into giving you strategies along with very good analysis skills and tools. You gain a clearer picture of the psychology of the market and what it means to understand important levels of support and resistance. I was also able to see the psychology of the market with continuation patterns. You learn how stocks react and when you match continuation patterns with resistance and apply the analysis together, you start to see how amazing this is. Lastly the CFD course helped with my psychology and trading over a shorter time frame and it unveiled a lot of the mystic around it, which also helped me greatly. In the short to medium term, I want to transition to a 3-day working week and trade on 2 days. Then possibly reduce that to a 2-day working week. My goal is to do this in the next 3 months. This will allow me to concentrate on spending more time with my family, dropping the children off at school and picking them up. Enjoying my hobbies like going to the gym, martial arts, cycling, my passion for reading. I want to travel more and I’m going to Japan and Hong Kong in June. While away, I will keep an eye on the market and read “How to Beat the Managed Funds by 20%” again. It’s good to refresh points and go back to basics no matter where you are in your trading. When I read this book for the first time I was just a newbie to the market, and I believe there may be things I can reinforce, as you should always be a student of the market.